On the threshold by Laura Butler © 2014. In 2010 Laura was selected as the solo artist by the Hilliard Gallery for the Kansas Irish Festival. 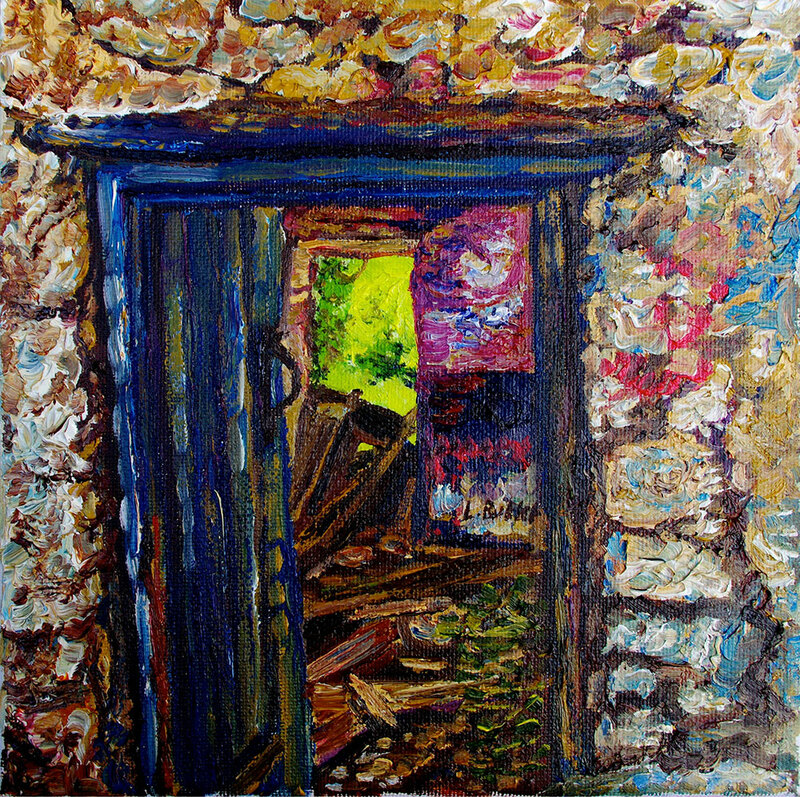 In 2011 and 2012 a number of her paintings were displayed at the Jam Art Factory, Dublin. Her first solo exhibition in Ireland, 'Living Stones' was held at the Museum at the Mill, Newtownabbey during March/April 2014. She has upcoming exhibitions in 2015, jointly with portrait artist Stephen Jamison in Newtownabbey in March/April, and a solo show in the Larne Museum and Arts Centre in August. You can find out more about her here and here. On the day of the Death of the Year I have a ritual. Kettle on, door closed, radio off. I empty my pockets out on to the table. Pebbles of all shapes and sizes scatter everywhere and I quickly scramble to stop them falling on the floor. Time to get sorting. The ritual is always the same so I know the best way to begin is to stretch my arms across the table through the stony sea and split them into two halves. Task divided, I begin. The first few take no considering, I grab them and drop them into the bucket beside me on the floor. These are older ones, stones I’d mostly forgotten about until they are there in front of me, sitting dull and mute on the tabletop. A wince as I think I should’ve done this ages ago but I shake it off and carry on. Never an easy task. The job begins to get a little more difficult. Decisions don’t come easily when the stones that are left become curious, shining strangely. They talk to me in whispers and hums, pleading, cajoling. Touching them brings shivers, comfort almost. I pick one up and look into it. It is solid, black, an eye – not mine – reflecting back at me from infinite depth. I know I shouldn’t keep it as my heart begins to ache in that old familiar way but I have to. Just for a little while longer. Don’t let me go. Another. As I hold it in a clenched fist I can see the tears, hear the conversation again, the confusion and anger at words said and unsaid. And the silence that followed. I open my hand. This one is fighting hard to stay, vibrating in my palm. I turn it and feel pain and relief at the clink as it hits the bucket. Things I said, things I didn’t say, opportunities wasted, friendships lost, chances unrecognised, calls ignored. All lie waiting on the table crying for attention. The stubborn pile I am left with is thankfully small. I fill a little bag and can sense their relief at escaping the cull. These will continue into the dawn of the brand New Year and beyond, perhaps next time I will let them go. I finish and leave the room, bag in pocket and bucket on the floor. Heartaching wailing silenced by closed door, they will die soon as I have stopped feeding them. I carry regrets like stones in my pockets. On the day of the Death of the Year, I get to drop some, which is nice. Now residing in Dublin, Evelyn D’Arcy spent her childhood living in the countryside in Meath, where she cultivated a love for writing from a very young age. She credits this love to the encouragement of her mother, who she says was her “first editor." Evelyn writes short pieces in the spaces she finds within a busy life working as an architect and tutor. Her blog is a collection of pieces connected with memory and dreams and trying to figure out what it all means.